Guest Post by Niko de Jonge, a friend of mine with several sports betting sites who's noticing a relationship between the odds makers and DFS in general. The Daily Fantasy Sports boom is still upon us. 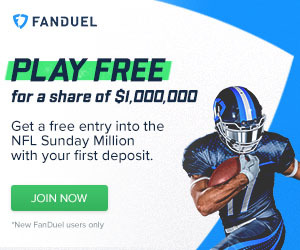 With both DraftKings and FanDuel receiving huge rounds of investments last year to continue their expansions, I think it’s safe to say that daily fantasy sports is going to continue to grow in popularity for the next several years. For me personally this means adding more Daily Fantasy Sports pages to my existing sports betting websites in order to give my visitors what they want and also to cash in on these new sign ups. I started out making websites after the poker boom in the mid 2000’s. After poker slowed down I realized I was far more interested in sports betting and I also decided that sports betting was always going to be a very lucrative business because people will never stop betting on sports, while poker could be considered more of a trending game in the early 2000’s. I decided to start my first big sports betting website, SportsBetListings.com. It’s still my biggest site to date and I continue to work on it every day. Now with the Daily Fantasy Sports boom I’m trying to build upon the Daily Fantasy Sports betting section of the website in order to keep the information up to date. I’ve noticed that a lot of online sports bettors are making the jump and trying out daily fantasy sports because it’s very similar in that you are predicting the outcome of a sporting event. If you are a profitable sports bettor, you can probably also become successful at daily fantasy sports and vice versa. The same is true for if you enjoy betting on sports online, then you would also surely enjoy daily fantasy. The bonus is that Daily Fantasy Sports is considered a skill game, which means those players who aren’t able to bet on sports because of their local laws and other restrictions they are able to easily play daily fantasy sports online. My other main website, SportsBettingCanadian.ca, was started about a year ago when I saw a need for Canadian oriented sports betting information on the internet. The majority of the sports betting info sites online were targeting Americans and because of the law differences between the two countries there were some very specific differences in terms of the online betting experience for players from each North American country. The best sportsbooks that accepted Canadians, the deposit options available, the Canadian government run sports betting options and of course which sports got the most coverage (NHL is huge in Canada) were not covered by most of these sites. Yes, there were already some other sports betting information and picks sites directed towards Canadians, but I found the information they were giving was incomplete and/or incorrect. Being a Canadian sports bettor, who already had some successful websites in the space I figured this was a perfect opportunity for me to focus my efforts on building an authority resource for Canadians looking to bet on sports. I haven’t looked back since and SportsBettingCanadian.ca has become my main site and biggest earner over the past year. I’m planning to continue to improve upon it in the near future and that includes vastly expanding the Daily Fantasy Sports section of the site.